Russia has begun military interventions in Syria, with the possibility of reinforcement by additional troops from SCO member states. 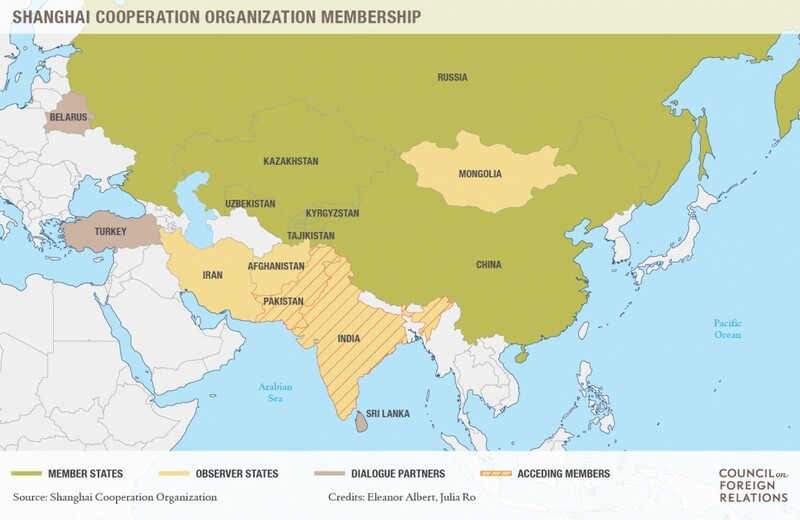 In the July summit of the China-led Shanghai Cooperation Organization (SCO), the two core missions were (1) admitting India and Pakistan as full members and (2) how best to counter ISIS and Islamic extremism within member territories. 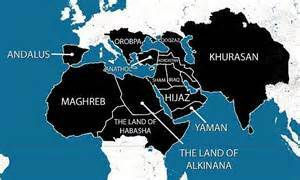 The territories include Central Asia, AfPak, Kashmir, Russia’s Chechnya and China’s Xinjiang that overlap with ISIS’s aspired caliphate. 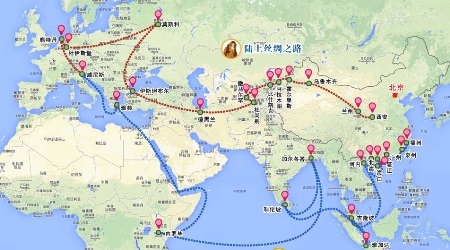 As such, ISIS ambition directly clashes with China’s grand strategy of establishing the Silk Road Economic Belt and Maritime Silk Road, (One Belt, One Road) across Eurasia. Indeed, China’s continual economic development is the backbone of the Communist Party’s legitimacy and survival, and as such any threat to Beijing’s access to energy supply from the Mideast, strategic minerals from Africa, and its largest export market in Europe is a red line for the regime. Since the People’s Liberation Army (PLA) is the military arm of the Communist Party rather than the Chinese state, Xi Jinping will deploy the PLA to defend Chinese interests and ensure regime survival when they are threatened. Which brings them to Syria. Syria is the jihadi hotbed of not only ISIS but also other Salafist extremists that threaten to attack Eurasia and radicalize its large Sunni population. Given Turkey-backed Syrian rebel groups include Chinese Uyghur jihadists from TIP, an al Qaeda affiliate originally based in Pakistan’s FATA but recently found a new home in Syria, China along with Russia, India, and Egypt see Assad as a bulwark against Sunni extremist groups consisting of radicalized Muslims from their own territories, as well as a bulwark against ISIS. Since 2012, the PLA has been increasingly alarmed by droves of Chinese Uyghur militants joining jihad and turning Syria into a new Pakistani FATA to launch attacks against the Chinese homeland. If Assad falls, jihadi fighters from Russia’s Chechnya, China’s Xinjiang, and India’s Kashmir will then turn their eyes toward the home front to continue jihad, supported by a new and well-resourced Syrian operating base in the heart of the Middle East. In fact, ISIS has already made inroads in SCO territory. On 16 July Kyrgyz security forces foiled two ISIS-linked attacks targeting Kyrgyzstan’s capital and a nearby Russian airbase. Factions of Taliban and Islamic Movement of Uzbekistan (IMU) have also pledged loyalty to ISIS, risking further provocation of ISIS presence in “Wilayat Khorasan” (encompassing Afghanistan, Central Asia and Xinjiang). India’s Lt Gen K H Singh likewise expressed alarm that ISIS would gain a foothold inKashmir and launch attacks from there. Thus, now that SCO has completed the first mission of admitting India and Pakistan into the Eurasia bloc, they can address the second mission of combating ISIS and terrorism. While SCO has hitherto been an internal collective security bloc and not a collective defense alliance targeted at external threats, in face of terrorist threats increasingly emanating from outside their territory, SCO is now projecting outward. United by the common threat of ISIS and radical Islam destabilizing their homeland, Russia, China, and India are setting aside their strategic rivalry in the Eurasia heartland and in May announced they would conduct their first joint counter-terror exercise later in the year. In June Egypt also submitted an application to join SCO. SCO already conducts joint military exercises similar to NATO, dubbed Peace Mission. Last August, SCO members conducted a large-scale counter-terror exercise to repel “foreign-backed separatism” in Inner Mongolia involving 7,000 troops, and the next one will likely be on a larger scale with new members India and Pakistan. As terrorist threats are now emerging outside of SCO borders, member states will need to follow similar US post-9/11 policy and take the fight to enemy territory—whether in AfPak, Iraq, or Syria. Indeed, in May China and Russia conducted “Joint Sea 2015” naval war games off the Syrian coast that is immediately followed by Egypt and Russia’s naval exercise near the Suez Canal. Beijing is also increasing its military power projection to protect its trade routes and mideast energy interests, in face of ISIS affiliates attacking Chinese COSCO shipping vessels in the Suez and ISIS’s regional expansion that threatens China’s energy supply. Concerned with regional stability and security, China is now building a new naval base in Djibouti in the Horn of Africa with a future contingent of 10,000 troops. This will substantially enlarge China’s current regional footprint under the UN banner: 1,000 troops in Lebanon, 1,000 troops in South Sudan (includes 700 combat troops), and 500 in Mali. Beijing has already deployed its elite counter terrorism force Snow Leopard to Iraq and Afghanistan and likely to Syria to combat ISIS. While in Iraq the US-led anti ISIS coalition has Peshmerga and Iraqi boots on the ground, it lacks similar partners in Syria now that Turkey has blocked Syrian Kurds in the coalition. As such, SCO can step in as much-needed infantry. There have already been discussions in China regarding sending troops to fight ISIS and in September 2014, China offered to help Iraq with airstrikes. Given US no longer needs Mideast energy nor would commit ground forces as it is rebalancing east to Asia, even while China is increasing its energy dependency and pivoting west on its Silk Road, China and SCO’s entry into the war against ISIS would be a welcomed step in Washington. It may also be welcomed by Israel, as China’s influence over Iran (and thus Syria) could potentially constrain Tehran’s actions against Israel that threaten China’s rapidly expanding investments in the region, especially with Israel’s key role in the Silk Road as an alternative Suez Canal for trade between China and Europe. And as China increases burden sharing to help maintain Mideast regional stability, becoming a “responsible stakeholder” and no longer accused by President Obama of being a “free-rider” regarding countering ISIS, this could be a step towards eventually forging a US-China “new type of great power relationship” in the Middle East. Christina Lin Dr. Christina Lin is a Fellow at the Center for Transatlantic Relations at SAIS-Johns Hopkins University. She is the authorof “The New Silk Road: China’s Energy Strategy in the Greater Middle East” (The Washington Institute for Near East Policy), and a former director for China policy at the U.S. Department of Defense.